The comic-book adaptations that DC have done, particularly for Batman, have been fantastic. Using animation means that they can stay as faithful to the original comic book as possible and in most cases, it leads to a direct, almost frame for frame remake. This would usually feel pointless but when it is Frank Miller’s comic book stories that are being adapted, it is well worth it. Batman: Year One was adapted brilliantly, as was the first part of his most famous Caped Crusader story, The Dark Knight Returns. I’ve already reviewed part one and my biggest issue was the use of villain. This was purely Frank Miller’s choice but when you bring The Dark Knight to the screen, there is clearly one villain people want to see and this movie doesn’t disappoint. The first part teases The Joker brilliantly and then he is brought to the fore well, as criminal and evil as he has ever been. Although they don’t use the timeless voice of Mark Hamill to voice the Joker, Lost’s Michael Emerson does a great job and the way the story progresses, finally leading to a resolution, with gore and broken bone thrown in for good measure, gives us one of the better Joker stories in animation. Arguably, The Joker isn’t this film’s main villain though and the second half brings with it one of the best moments in the comics, faithfully adapted. The now influential Batman vs Superman that seems to offered more than a passing inspiration for The Dawn of Justice, makes for a great animated moment. “That speech” that Batman delivers at the climax of the battle only teases and excites for what we could see Ben Affleck and Henry Cavill deliver in their live-action version. Considering the movie is a straight adaptation of the comic book, this film was never going to be anything but brilliant. It is one of Frank Miller’s best and also one of the best Batman stories. All DC had to do was bring it to the screen and by also using the same style of animation, it is as close to watching the comic as you’ll get. Watching this directly after the first also improves that movie, as this is the better half, with the more iconic moments and cooler action. It is also an example of why animation in movies needs to be taken seriously. A Batman cartoon will never get the same recognition or respect as it’s live action counterpart but both this double-parter, Year One and the upcoming The Killing Joke demonstrate how effective the best of the comics can actually be when brought to the screen. 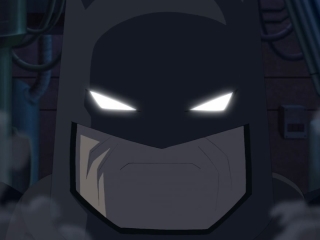 Overall, The Dark Knight Returns’ second part improves on the almost perfect best by adding the iconic villain and Batman’s biggest super-rival. The action is better, the story more compelling and the animation testament to how good the actual comic book it is adapting is. I can’t wait for more of these. Downplaying animation in lieu of live action is a bit like enjoying the symphony, but dismissing the instruments… imo.